The NPC Guide: The Babies Are Back! Cave raptors are sated and have finally released me from their grim, stony world—it's time to blog! Back when I served as a lowly intern, a weary and overworked Sean K Reynolds offered me my very first Paizo gig. 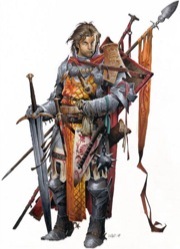 The encroaching Pathfinder Chronicles: NPC Guide would need dozens of generic stat blocks if GMs were to treasure it above even their own families. A not-insignificant portion of my sanity died off as I stared into the abyss of an estimated twelve billion 1st- to 5th-level nonplayer characters, but ultimately the turnover made its way back to Sean and his shiny, shiny knife. In any creative industry, there's a phrase that goes something like, "Your babies will get cut first." Meaning that in any creative project, your favorite elements or that extra something special you really loved creating will probably end up on the cutting room floor. The NPC Guide was no exception, and several of my favorite characters ended up cold and lifeless at Sean's feet. But now, through the miracle of the Internet, I have the power to bring them back! So behold these glorious characters, free of charge! Behold the glory that is the Internet! Er... I mean, check out these sweet NPCs, coming straight to you as a super-sized web enhancement for the NPC Guide. This first installment of five is only the beginning; we'll toss up more batches from time to time, so stay tuned. Hero or villain, the Gunmarshal stands as a proud icon of Alkenstar's victory over the chaotic Mana Wastes. Even gunslinging rogues and bandits are influenced by honor and tradition afforded by that pride. Gunslinger (Ex) This character does not provoke attacks of opportunity when attacking with firearms. See page 59 of the Pathfinder Chronicles Campaign Setting. Though feared for their swords and the mad gleam in their eyes, the one memory that forever haunts those who've warred against the orcs are the drums. Carried for miles across hills and rocky plains, the ominous drumbeats of orc thundering choir musicians weigh on the minds of men like the heartbeats of tireless predators, never stopping, never slowing. 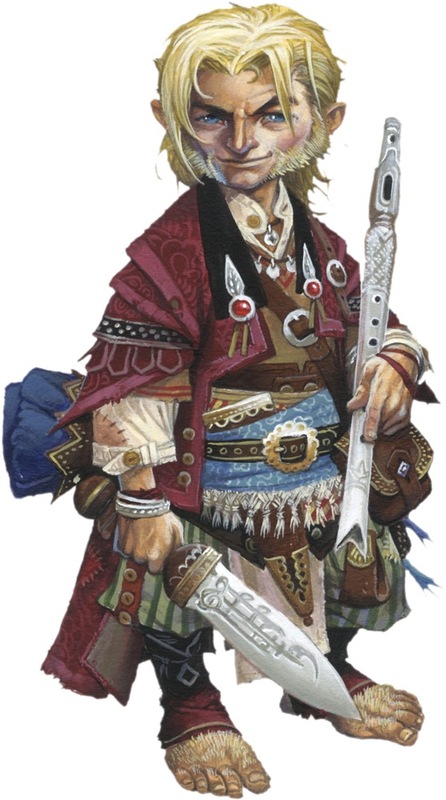 The thundering choir musicians are fierce warriors, but the rhythm of their drumbeats and chants is their foulest weapon, whipping other orcs into murderous frenzies and inspiring terror in the hearts of even the bravest men. By achieving wealth, the Prophets of Kalistrade prove themselves more righteous than those around them. They travel to discover converts and new business opportunities, furthering their enlightenment. Part entrepreneur, part cultist, they open doors and pull strings for those they consider friends, or financially hinder their detractors. Feats The Kalistrade prophet has the Profits of Kalistrade feat, which grants him a "resource pool" of 300 gp, allowing him to obtain goods of this value even in settlements too small to have something that expensive. See page 73 of the Pathfinder Chronicles Campaign Setting. In the eyes of some dwarves, the civilizations of the surface world slowly erode dwarven culture and values, tearing away at their heritage like the rain wears away great stone monuments. Elves bear inefficient frippery, while humans buck the social order, and the less said about halflings and gnomes the better. These traditionalist, xenophobic members of dwarf society would love nothing more than complete isolation from other cultures, and perhaps even to return to the depths of the Darklands. While this usually amounts to little more than talk, the numbers of these radical conservatives swell on occasion into dangerous political groups and gangs. The practical seat of power within Geb rests with the Blood Lords. Administrators and necromancers both, any family of repute attempts to position their members within its ranks. The most fortunate embrace undeath, gaining immortality as vampires, ghouls, or other intelligent undead. It seems like I’m the guy who usually ends up running the game, so when Sean announced that he was going to run a high-level campaign where all the PCs would be demon-worshiping drow nobles, I jumped at the chance to play. After all, high-level play, demons, and drow are three of my favorite things! You got a first look into the mayhem of our first session last week when Sean showed off his creepy black light, but today I’m going to tell you about my character. Like it or not! 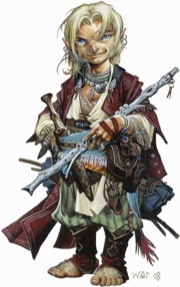 Alivorah Azrinae (CE female drow noble bard 7/demoniac 6) is something of a troublemaker, even in drow society. She's gotten in hot water with the Azrinaes many times in the past for cavorting and fraternizing with other houses—she thinks of herself as a spy, and loves learning secrets about other people and organizations. Her main problem is that she doesn't follow orders well and doesn't like divulging secrets without learning a secret in return—a trait that makes her not very helpful as a spy to anyone but herself. As a demoniac, she bears the mark of Abraxas on her right shoulder as a pale tattoo-like marking. Currently, she's a bit agonized by the fact that she actually knew a few secrets about the attack on the Azrinae family—had she divulged them, she could have possibly saved her house from being exiled. Her main goal now is to see that the Azrinae family gets to return to Zirnakaynin in a greater position of power than before. And if she gets herself a promotion in the family to a position of greater power, all the better! The attached picture features the miniature I’m using for Alivorah, standing next to her entry on the family tree chart that Sean provided us. The mini (which was painted for me by the always-awesome Stephen Radney-MacFarland, who’s mini-painting skills are SIGNIFICANT) is one I originally used for Jason’s campaign a year or so ago, but since Jason quit running that game, I saw this as a great opportunity to use my cool drow mini again, even though she doesn’t really match the type of gear Alivorah carries. Also, those with keen eyes will note that Alivorah is the sister of Rob McCreary’s character, and that Josh is playing her uncle and Crystal her aunt. Should make for some interesting dynamics around the table! As for that bit about being a “demoniac,” well... that’s a prestige class I’m taking the opportunity to playtest during this campaign. Originally presented as the 5-level demonic initiate prestige class in Pathfinder Adventure Path #15, this class is being upgraded to a 10-level prestige class and renamed to “demoniac” (the noun definition of which is “a person seemingly possessed by a demon or evil spirit”—it’s not a prestige class for characters who make smart decisions regarding the well-being of their immortal soul). Full details on the demoniac prestige class will appear in the upcoming Lords of Chaos: Book of the Damned Volume 2. Obedience Self-flagellate with a small whip or tree branch, punctuating each stroke with utterances of mystic words of power. Gain a +4 profane bonus on saves against written magical effects, such as sepia snake sigil or symbol of death. 2: Heretical Revelation (Su) Up to three times a day you can whisper terrible secrets to an adjacent target as a standard action. The target can resist with a Will save (DC = 10 + 1/2 your HD + your Charisma modifier). If the target fails its save, it is stunned for 1 round, then confused for 1d4 rounds, and then nauseated for 2d6 rounds. This is a mind-affecting effect. 3: Penultimate Incantation (Sp) You affect a single creature within 60 feet with a targeted greater dispel magic. Each spell or effect dispelled inflicts fire damage to the target equal to the result of your caster level check made to dispel the magic. Earlier this year, fellow intern Matt and I were invited to begin playing in a Pathfinder RPG game run by local resident Crystal Frasier. We accepted, and Matt, Ross Byers (later to leave us for reasons involving Will saves and girl-cooties), and I began our quest to become... The Stuff of Legends. Deciding to make my life difficult, I made Klar, the burly and buff bluffing bard, Matt rolled up Zirithanis the hobo druid and Destroyer-of-Worlds-Fetcher-of-Dreams-Maxwell, his longtime friend and goblin-hating murderous dog of war, while Ross Byers began his quest as the excessive sorcerer, Aurelis. Our team assembled, The Stuff of Legends' first dabble into adventuring follows. Meeting with the mayor, we understood that we were to stop mysterious sabotage attempts on a hopeful resort town in the Varisian Gulf. Naturally, our business powwow was interrupted by screams: Goblins had invaded the bathhouse! Having studied Goblinoid languages in a Chelish Opera College, I tried to negotiate with them, but their crude language and dubious use of the honorifics "dog-lover" and "ugly-face," made communication difficult. While I eventually gained their trust, my inquiries into why they would invade a bathhouse were met with confusion over failed translations of the words "bath," "clean," "soap," and "hot water." They began to suspect that I wanted to cook them, eventually leading us to armed conflict. After Maxwell the Dog dispatched two of the goblins (Aurelis proved his worth as an electric stove, cooking one with shocking grasp), we entered the bathhouse, only to be ambushed again! Two stirges and a goblin sniper were difficult foes, yet, with the ever-suspect "oh, are you still singing?" of bardsong, Maxwell destroyed all opposition. Afterward, finding the public bath infested with vipers, we left them for the town's pest control. When we later realized that was Zirithanis' job, we went back and he charmed them into a wicker basket and left them at the edge of town. When we later heard a picnicker was killed by vipers, we blamed Zirithanis. However, being playtest time, an unexpected enemy followed us into town: the Goblin Oracle! She was one of the most feared enemies we have ever fought, especially since we lacked Aurelis's help (he was sleeping off breakfast in his 100-gp suite on the coast). Perhaps it was her big hat, or maybe the threat of goblin rash from her two mangy rat-dogs, or maybe her fury over the sacked child she took hostage that was greased out of her hands, but the strength of her unusually fearsome blows felled both Zirithanis and me at different points. Our leapfrog healing tactics took her by surprise, however, keeping us both in the fight. In the end, Maxwell the Dog killed her, jumping over a mountain, stopping a flood by barking, and then arriving home in time to snap her neck and take the glory for himself. Next: Maxwell Defeats Giant Wheeled Eidolon and Eats It. Alpha release #2 of the Pathfinder RPG has already been released as a free download, and playtesters are posting up a ton of feedback on our forums. In the next few weeks we will be posting up release 3, the final release before the Beta version of the game this August. This past weekend saw the debut of some of the rules at Paizocon, a convention just north of our offices. Attendees got to meet with the staff and play some games. Those who sat down at my table got a chance to play with some of the new rules, including a preview version of the bard. It should be noted that all of these characters were horribly cursed, and Oglam here is no exception. His drums cause those who hear his music to bleed from the ears unless he makes a DC 20 Will save every time he begins playing. Of course, being a NE bard, dedicated to Rovagug, meant that he did not care much about the pain of others. Here are a couple of quick notes when taking a look at Oglam. Song of Doom allows him to cause enemies who hear his playing to become shaken. Distraction works similar to countersong, but it works on visual patterns and figments instead of sonic effects. Well-versed gives Oglam a bonus on saves against the bardic music of others and on sonic and language dependent effects. Finally, bardic knowledge gives Oglam a bonus of +4 to all Knowledge checks, and allows him to make such checks untrained. There are many more secrets here, waiting to be discovered. For the full details, make sure to download release 3 of the Pathfinder RPG available in just a few weeks. Pathfinder #1 and the Rise of the Runelords Player's Guide ship this week, and as such, we thought it a good time to unveil a sample spread from the guide. 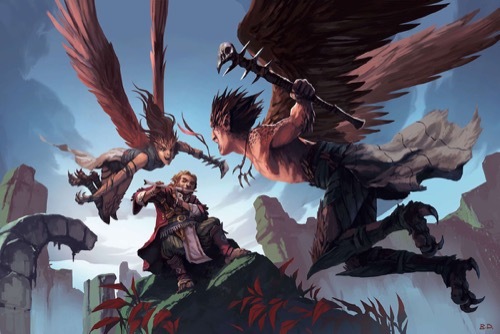 Presented here for your perusal are two pages full of new animals, local takes on the core classes, and a full chart detailing all of the core gods of our setting. So what are you waiting for? Click the image to download a full-size version and dig in!